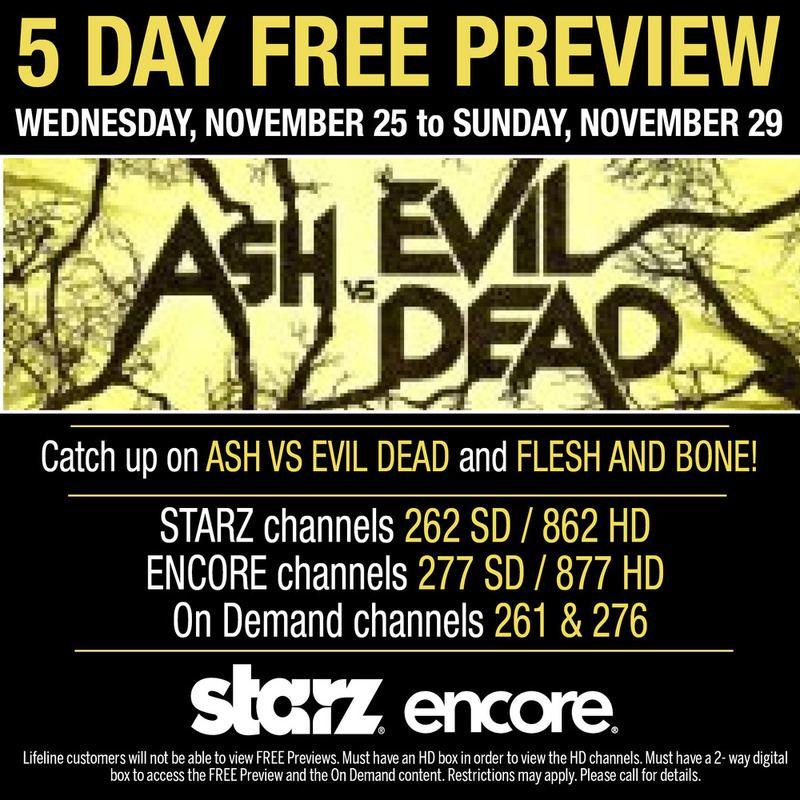 FREE 5 Day Weekend of Starz and Encore, November 25 - 29! Starting November 25, get on board and start your adventure with a free preview weekend from Starz and Encore. This November, enjoy original series that break convention and movies that continue to captivate audiences. Compliments of MCTV, watch a FREE 5 day weekend of Starz and Encore, November 25 - 29! Explore the dysfunctional world of professional ballet with the new series FLESH AND BONE, and watch the entire first season On Demand! Catch up with the campy comedy series ASH VS EVIL DEAD, and watch many thrilling films including, MCFARLAND USA, BIG HERO 6 and THE WEDDING RINGER. Please call the MCTV office to set up parental controls if you do not wish to receive the preview in your home. ASH IS BACK, BABY: The man, the myth and the chainsaw return on Halloween. ASH VS EVIL DEAD follows Ash (Bruce Campbell), stock boy, aging lothario and chainsaw-handed monster hunter who spent 30 years avoiding responsibility, and the terrors of the Evil Dead. He encountered creatures of unspeakable evil and survived. He has successfully avoided them since …. until he makes one very stupid mistake. STAY ON POINTE: From Emmy Award winning writer and executive producer of Breaking Bad, comes the story of Claire (Sarah Hay). Claire, a talented but emotionally troubled dancer, joins a company in New York City. Having escaped an abusive past, she harbors self-destructive tendencies, and is plagued by sexual restraint despite vaulting ambitions. Her inner torment drives her in unforeseeable ways. She is on a journey of self-discovery without a compass. She unflinchingly explores the dysfunctional and glamorous world but soon finds herself immersed in the tough, often cutthroat, world of professional ballet. Watch the ENTIRE season of Flesh and Bone on November 8 On Demand. VITRUVIAN MAN: Leonardo da Vinci’s (Tom Riley) world comes crashing down when the city of Orlando is torn apart by an Ottoman invasion. On the battlefield, the Turks use Da Vinci’s own weapons against him … the designs for which were stolen from someone he trusted. All series available from STARZ: Camelot, The Pillars of the Earth, Party Down, Magic City, The Chair, The White Queen, Spartacus, Black Sails, DaVinci’s Demons, The Missing, Outlander, Power, Flesh and Bone, Ash vs. Evil Dead, Survivor’s Remorse and Blunt Talk. Add Starz and Encore today and receive 50% off for 6 months + get $25 cash back! Enjoy access to 25 channels (8 in HD), 1900+ HD hours online with Starz Play and Encore Play, and 240+ SD hours On Demand! Get into everything with STARZ and ENCORE. Be a part of every thrilling escapade, mystery and romance. Every fantastic journey, every day, any way you want it, right here on STARZ and ENCORE. Enjoy the riveting dramas DA VINCI’S DEMONS and BLACK SAILS, plus Disney films and a great lineup of big movies. Enjoy over 240+ hours, all on your schedule, with On Demand channels 261 & 276. You can stream 1900+ hours of programming, every episode of every season, in stunning HD with STARZ PLAY and ENCORE PLAY. Catch up on past seasons of OUTLANDER, POWER, SURVIVOR’S REMORSE, and THE MISSING before the new seasons start! Dive into recent classics like SPARTACUS, MAGIC CITY, CAMELOT and THE WHITE QUEEN. PLUS, new in 2016, enjoy the original series THE GIRLFRIEND EXPERIENCE! Sign up today and enjoy every adventure with STARZ and ENCORE. *Can view SD channels with a 2-way digital box. Lifeline customers will not be able to view the free preview. You must have an HD box in order to view the HD channels. You must have a 2-way digital box to access the FREE preview and the On Demand content. When package is purchased, On Demand and Online Starz & Encore content is also available to view for free. Restrictions may apply. © Starz Entertainment, LLC. All rights reserved. Starz®, Encore® and related channels and service marks are the property of Starz Entertainment, LLC. Free preview available to digital subscribers in participating systems only. Not all services available in all areas. Previews may contain PG, PG-13, TV-14, TVMA and R rated programming. Programming is subject to change. If you do not wish to receive the preview in your home, please contact your local service provider and set up parental controls. Please call for details. 50% off expires 11/30/15. Starz will revert to regular rate once promotion is finished. The $25 rebate is available after 3 months of Starz service from Starz at www.starz.com/starzoffers. You must be an MCTV cable customer in order to receive the offer. Promotional offers are only available to MCTV residential customers who have not had the service(s) in the promotion in the past 90 days and have not been disconnected for non-payment in the past 6 months. Other restrictions apply. Please call or visit www.MCTVOhio.com for details.